TOURNAMENT EURO SPORT, MATRIX SPORT and FITNESS BOARD are three types of Coswick hardwood sports flooring that are designed for training and tournaments, for gyms and all-level team sports: basketball, volleyball, handball, squash, etc. 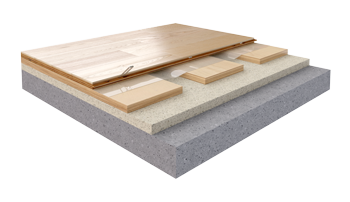 TOURNAMENT EURO SPORT is a two-layer engineered parquet on a two-layer sleeper system that lies on the high-density expanded polyurethane pads. Apart meeting the requirements of a pan-European standard, it qualifies for more strict requirements of the German standard DIN 18032-2. Total height of the structure is 55 mm. This flooring has a deck-style pattern. 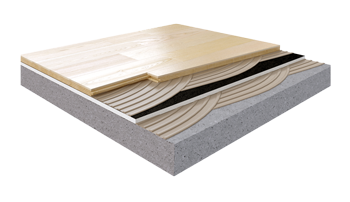 MATRIX SPORT is a two-layer engineered parquet on a shock-absorbing sleeper structure that lies on a cushion base. Total height of the structure is 43 mm. This flooring has a deck-style pattern. 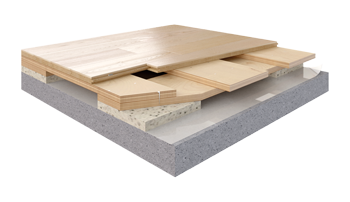 FITNESS BOARD is a two-layer engineered parquet laid on a shock-absorbing base with a flexible adhesive. This flooring has a deck-style pattern. The secret of sports specifications uniformity – absorption, sliding, bounce – lies in the carefully chosen allocation, elastic behaviour of all elements, and a specific sports lacquer.